If I were to try to tell that ancient Japanese fable in our modern Canadian context what might it sound like? You’re driving along in the car, widows open, listening to some tunes thinking hey look at me, I’ve got it pretty good, when all of a sudden a guy pulls up along side of you in a beautiful in a sleek e-type jag convertible, woe! If I could afford a car like that, just think about how great it would be to pull away from all the other traffic, the wind blowing through my hair, wouldn’t that be great. Well you save your pennies and you finally get the car of your dreams, and your driving along and you see this house, not just any house, but the most beautiful house in the neighbourhood, and you know there’s just got to be a pool in the backyard, and you wonder maybe, just maybe there’s a Jacuzzi in one of the dozen or so rooms and you know that if you could come home to a place like that, well then you’d be really happy. So you work hard and you scrimp and you save and one day, you get your hearts desire and you turn the key in the lock an all of a sudden your living in the house of your dreams. But there’s the pool to clean, and the gardens to maintain, and a lot of rooms that need dusting and you see that your neighbours have a pool boy, a gardener, and a housekeeper and you know if you could only afford to hire some help then you’d be happy. You know that with just a few more bucks in your bank account you’d be happy. So, you wish and you wish and one day you win the 649 and you have millions of dollars, several beautiful cars, lots of staff to keep everything ticking over, and no one to share it with. To be fair, not everyone is hungry for wealth or material things. Some of us have other hungers. Some of us indeed, are longing for more spiritual things. Those of us who gather in a church on Sunday mornings, generally have a handle on our material longings, if only for a little while we are hungry for spiritual meaning. We long for a more spiritual life. We long to know God. We long to experience communion with God. Or we hunger and yearn for a deeper understanding of the cosmos? We want answers to our deep questions. Or we yearn for assurances that when all is said and done we’ll everything will be tickety boo and we’ll dwell for all eternity with all our loved ones and never be sad again; or we long for knowledge so that we can serve our neighbours, or we just want to be around people who appear to be on the same journey as we are selves are on, or we just want to satisfy a loved one who seems to get something out of Sunday mornings in church. We’re all here trying to satisfy some hunger or other and to all of us Jesus says, “I AM the bread of life.” But try as I might dear Jesus, I’m still hungry. I know you are the bread of life, and I know that “Whoever comes to you will never be hungry and whoever believes in you will never be thirsty.” But here I am Lord, yearning, longing, needing and wanting something more. So, I continue to study, I pour over the scriptures and I read the works of great theologians, and I hunt and I search and I pray, and I try to listen. Won’t you please give me some of that food that does not perish? I just can’t get no satisfaction, and I try and I try! I suppose that’s why I became a pastor in the first place. I know that it’s more politically correct to say that I wanted to be a pastor so that I could serve God or serve those around me. I suppose that those noble reasons were a part of my initial reasons for working to become a pastor. But if I’m honest, I suppose I’m actually up here as a result of my own hunger and desire to know God. 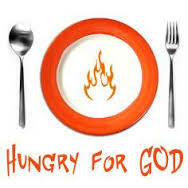 For me manna or bread from heaven, takes the form of intimacy with God. I’d like to believe that I became a pastor in order to serve, but deep down I know that I became a pastor to satisfy my own hunger for God. I know that each of us is here today for all sorts of reasons, but I believe that deep down inside each of us there is a hunger that drives us; a hunger to know the One who made us, the One who lies at the very heart of this thing we call reality; the One who is so much more that we can begin to imagine. The One we hope is there. The One we long for with a kind of hunger that drives us to places we never dreamed we’d go, searching for the knowledge of the ONE who IS. Jesus said, I AM the bread of life. Jesus also said, I AM the Way the truth and the life. The people who heard Jesus all those centuries ago, were Jewish and they would have understood Jesus when he said, I AM. I AM is the very name of God. YAHWEH. I AM, the very name of God is the verb to be: I AM, being. We fill our lives with distractions in the vain hope that the distractions can satisfy our hunger. When only the I AM that lives within each of us can ever satisfy our hunger. But where can we find this bread? Give us this bread to eat! When I was a little girl, my parents taught me that if I held up a seashell to my ear I would be able to hear the ocean. I remember listening to the sound of the ocean for quite some time before I ever realized that the sound that I was enjoying so very much actually came from inside of me. Jesus said, “I AM the Way.” Jesus who was so sure of himself, so confident as a child of God so clear open to the love of God who is the Great I AM, that he was able to say, “I AM the way the truth and the life.” And yet, we try to fill our hunger, our longing, our emptiness with distractions from our very selves and distracted from ourselves we can’t love ourselves, and if we can’t love ourselves we can’t love one another and if we can’t love one another our love for God fails and we are left hungry once more. We can allow the distractions of this world lull us into a kind of dullness and we can go trough life just going through the motions never really tasting all that life is. Or we can awaken to our very selves and begin to learn about our very being. I AM the bread of life. I AM. We can wake up to the fact that we are created in the very image of God, the great I AM and in that image we can begin to learn about God. Now please notice that I am not saying that we are God. But rather, that we cannot begin to know God if we do not know ourselves. Knowledge of the great I AM begins with knowledge of the self. There are those who would say that this is just selfishness. But do not be afraid because as you lean about yourself you will discover what it means to be created in the image of God. You will discover your own need to connect; your own longing and desire to connect with the great I AM who is love and there you will discover that your longing is surpassed by the longing of God for all that God has made and there you will discover love—You will discover that you are created in the image of the great I AM who is love- and you will begin to be love. Jesus said, “I Am the way the truth and the life. I AM the very bread of life. May you, who are created in the image of the great I AM begin to discover what lies within, and like Jesus you will be on the way, on the Way to loving God with all your heart, with all your soul, and with all your mind and loving your neighbour as you love yourself. The bread of life is yours! Take and eat. For you are daughters and sons of the Great I AM, begotten and loved, nourished and fed, with blessings overflowing you need not be hungry or thirsty! You have everything you need to love God and to love your neighbours as you love yourselves. Let it be so, let it be so. Amen! This entry was posted in Adult Education, Evolutionary Christianity, Home, Progressive Theology, SERMONS, STORIES, Theology and tagged Bread of Heaven sermon, emergent theology, Exodus 16:2-15, Japanese Fable, Lutheran sermon John 6:24-35, Manna from heaven, Ordinary 18B, progressive Christian sermon John 6:24-35, progressive Christian sermon Pentecost 11B, progressive christian spirituality, progressive christianity, progressive theology, Proper 13B, spirituality, The Stonecutter by Rev. Dawn Hutchings. Bookmark the permalink.